The all-new MC4000 is a 2-deck Serato MIDI controller for the professional DJ, wrapping in demand audio manipulation tools in a robust steel chassis. In addition to precision touch-activated jog wheels, performers get access to dedicated hot cue and sample pads for on-the-fly creativity. Long-throw 100mm pitch faders and an intuitive control layout deliver natural operation when balancing complex set elements. Known for their emphasis on sound quality, Denon DJ includes a premium 24-bit audio output path for noticeably clearer mixes. Denon DJ's highly regarded dual microphone inputs are complemented by a studio-grade echo effect, and "ducking" feature?effortlessly moving vocals to the top of the mix without riding faders. The MC4000 includes Serato DJ Intro and will be compatible with Traktor 2, and Virtual DJ 8. "The MC line has always represented premium features for discerning DJs," noted Silvio Zeppieri, Denon DJ Product Manager. "The new MC4000 punches well above its weight by including the tools DJs need to drive a memorable event. The layout, portability, audio quality, the inputs and outputs?it's spot-on for Mobile Entertainers, and we cannot wait for the world to get their hands on it." With a well-deserved reputation for their emphasis on sound quality, Denon DJ includes a premium 24-bit audio output path for noticeably clearer mixes. Denon DJ's highly regarded dual microphone inputs are complemented by a studio-grade echo effect, and "ducking" feature?effortlessly moving vocals to the top of the mix without riding faders. 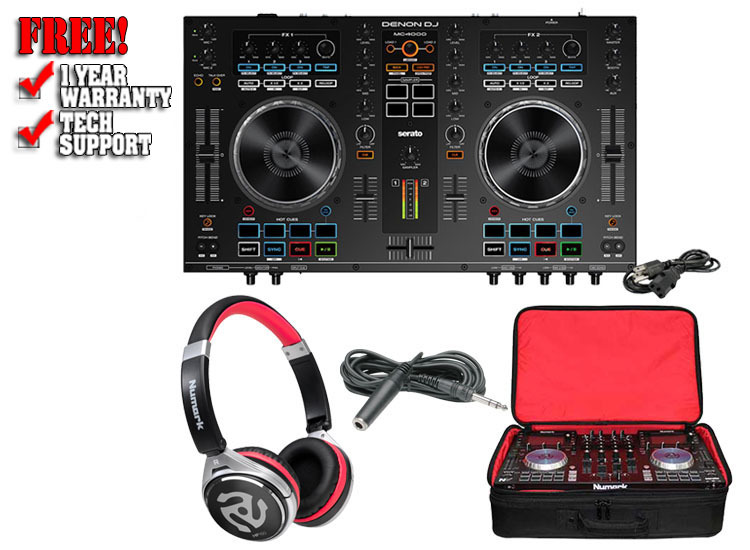 Denon DJ's Controller line has always represented premium features for discerning DJs. The MC4000 punches well above its weight by including the tools that professional DJs need to drive a memorable event. The layout, solid construction, portability, audio quality, the multiple inputs and outputs?it all adds up to a spot-on performance for the demanding mobile entertainer. Premium 2-Deck controller for Serato. Includes Serato DJ Intro; user-upgradeable to Serato DJ. Touch-activated jog wheels for accurate scratching and track cueing. Dedicated hot-cue and sample trigger pads with illuminated feedback. All-new control layout for effortless, intuitive use. Dedicated EQ and FX controls on each channel. (2) balanced mic inputs with 2-band EQ, Ducking, and Echo effect. Compatible with Traktor 2 (via .tsi files) and Virtual DJ 8. RCA Aux input for external device mixing. Balanced Main and Booth Outputs. Compatible with Traktor 2 (via .tsi files), Algoriddim djay Pro and Virtual DJ 8. 40mm drivers are what you can expect in a full-size headphone, but the HF150's expertly engineered design manages the power and capability of a large transducer inside the most portable form-factor?at just a fraction of the size. A major step up from earbuds in every way, the exceptional sound quality means you will hear things you were missing in even your favorite tracks. The result? Better mixes, every time, anywhere. Odyssey presents the Redline Series, cutting edge bags for today's on the go DJ / Remixer / Producer. Each design not only makes you look good, they make you feel good. The Redline Digital XLE bag lets you take a wide variety of your essential gear for your digital set up from one gig to the next. Within the main compartment are unique foam inserts that can be easily reconfigured or removed so you can safely store whatever your gig at the time demands such as mixers and large format tabletop media players, or digital controller such as the Denon DN-MC3000, Traktor Kontrol S4, or Mixtrack PRO II. It has enough pockets to store all your necessities and is fully padded in all the right places with a steel frame reinforcement for the ultimate in digital gear protection. Reinforced Steel Frame Prevents Vertical Crushing and Sagging. Fully Padded for Gear Protection. Adjustable Foam Inserts To Customize Main Compartment to Your Gear. Heavy-Duty Zippers and Zipper Pulls. Convenient Elastic Band Cable Holders. Sturdy Bottom Feet Increases Vertical Stability. Padded Handle and Shoulder Strap for Extra Comfort. Main Compartment Interior Dimensions:21.5" x 3.5" x 14.25".